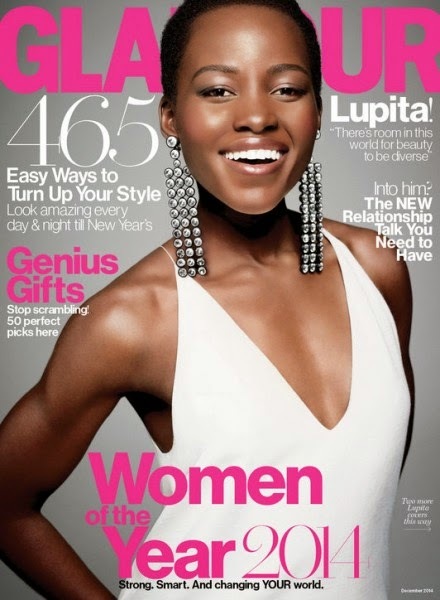 Lupita Nyong’o is on the cover of Glamour as one of their women of the year 2014, and opens up on how she is coping with her almost instant success in hollywood and becoming an overnight celebrity. 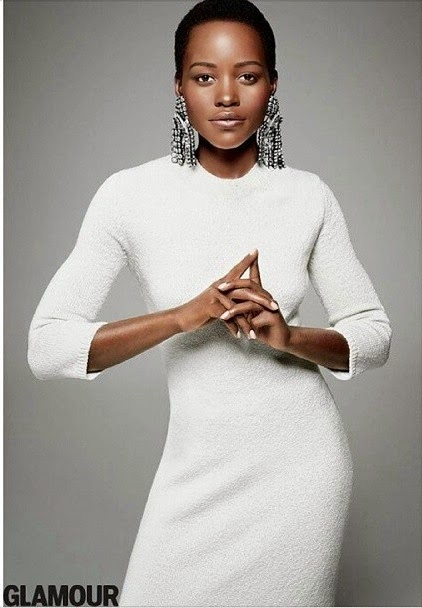 She also talks about growing up in Kenya and coming into her own black beauty over time. GLAMOUR: You've received lots of attention for your looks. Did you grow up feeling beautiful? LN: European standards of beauty are something that plague the entire world—the idea that darker skin is not beautiful, that light skin is the key to success and love. Africa is no exception. When I was in the second grade, one of my teachers said, "Where are you going to find a husband? How are you going to find someone darker than you?" I was mortified. I remember seeing a commercial where a woman goes for an interview and doesn't get the job. Then she puts a cream on her face to lighten her skin, and she gets the job! This is the message: that dark skin is unacceptable. I definitely wasn't hearing this from my immediate family—my mother never said anything to that effect—but the voices from the television are usually much louder than the voices of your parents. GLAMOUR: So how did you get over believing that? LN: I come from a loving, supportive family, and my mother taught me that there are more valuable ways to achieve beauty than just through your external features. She was focused on compassion and respect, and those are the things that ended up translating to me as beauty. Beautiful people have many advantages, but so do friendly people.... I think beauty is an expression of love. GLAMOUR: You can't deny that it's also an expression of genes. LN: Lovely genes! But to rely on the way you look is empty. You're a pretty face—and then what? Your value is in yourself; the other stuff will come and go. We don't get to pick the genes we want. There's room in this world for beauty to be diverse. GLAMOUR: You've become so popular that people talk about "the Lupita effect," which includes everything from consumers running out to buy the lip gloss you're using to designers casting more women of color on the runway. How do you react to that? LN: I giggle. I just heard it for the first time. I've heard people talk about images in popular culture changing, and that makes me feel great, because it means that the little girl I was, once upon a time, has an image to instill in her that she is beautiful, that she is worthy—that she can... Until I saw people who looked like me, doing the things I wanted to, I wasn't so sure it was a possibility. Seeing Whoopi Goldberg and Oprah in The Color Purple, it dawned on me: "Oh—I could be an actress!" We plant the seed of possibility.